A naval parade in Callao, Lima in honor of Admiral Miguel Grau and the Battle of Angamos. Photo by Galeria del Ministerio de Defensa del Perú, flickr.com. Below is a list and description of all the festivals and cultural events in Lima (read my Lima travel guide for more about Peru’s capital city). These include annually recurring festivals, traditional celebrations, and notable upcoming cultural events like food fairs and book fairs. For major concerts and music festivals in Lima — updated regularly — read Music Concerts in Peru. Adoración de Reyes Magos (Epiphany) — In Lima, the Adoration of the Magi is notable for a procession led by three mounted policemen dressed as the Three Wise Men (the biblical Magi). They ride through the streets carrying offerings to the Municipality building. Foundation of Lima — Major celebrations and civic events take place across Lima to mark the capital’s foundation. The conquistador Francisco Pizarro founded Lima on January 18, 1535. Carnaval — February is carnaval month across Peru, and the festivities are particularly vibrant — and chaotic — in Lima. Processions, folkloric dances, concerts and shows take place across the city. But the most famous aspect of carnaval are the numerous water fights that take place in the streets. Buckets of water, water balloons, water pistols: all are used to soak innocent passers-by. Keep your camera safe. Día del Pisco Sour (Pisco Sour Day) — This annual event pays tribute to Peru’s national cocktail, the pisco sour. Keep an eye open for pisco sour offers in bars and restaurants, and other pisco sour-related events. You can read more about pisco sour and other classic pisco cocktails here. 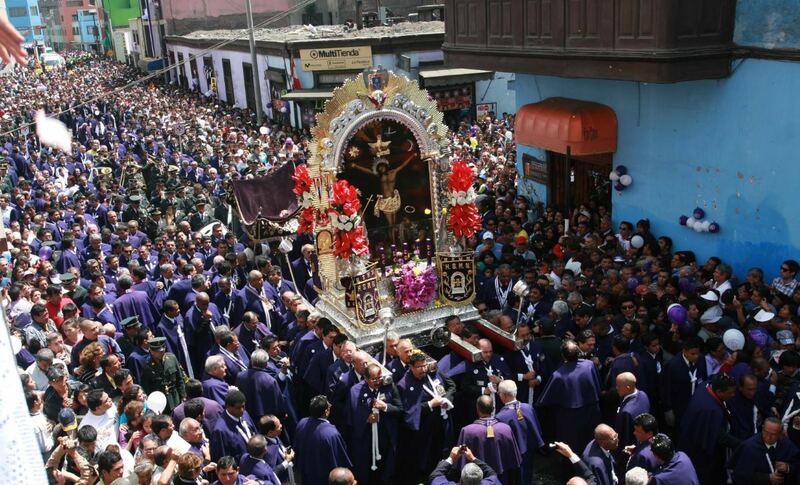 Semana Santa (Holy Week) — Celebrated throughout Peru, Semana Santa, or Holy Week, is the week leading up to Easter (but does not include Easter Sunday). It’s a moveable feast, so dates vary depending on the year. In 2018, Holy Week runs from March 25 to March 31. Anniversary of the Constitutional Province of Callao — The Constitutional Province of Callao is a bit of an oddball, administratively speaking. It’s part of the wider Lima Metropolitan Area (and it’s home to Lima Airport), but it’s also a unique administrative region of Peru. People from Callao, known as chalacos (a Peruvian demonym), are a proud bunch. Expect plenty of parties and street parades when they celebrate their anniversary, which dates back to April 22, 1857. Lima Jazz Festival — Jazz fans can enjoy an extensive program of musical events in Lima, typically held on multiple days in April. You can check the latest details at the Asociación de Jazz de Lima Facebook page. Lima Food Week — The fifth installment of Lima Food Week took place between April 24 and May 7 in 2017. During the event, many of Lima’s best — and most expensive — restaurants offered lunch or dinner at a set price (in 2017, S/ 59 and S/ 79 respectively). Not exactly backpacker-friendly prices, but still cheaper than normal for these top-end restaurants. Dates for 2018 are not yet available. 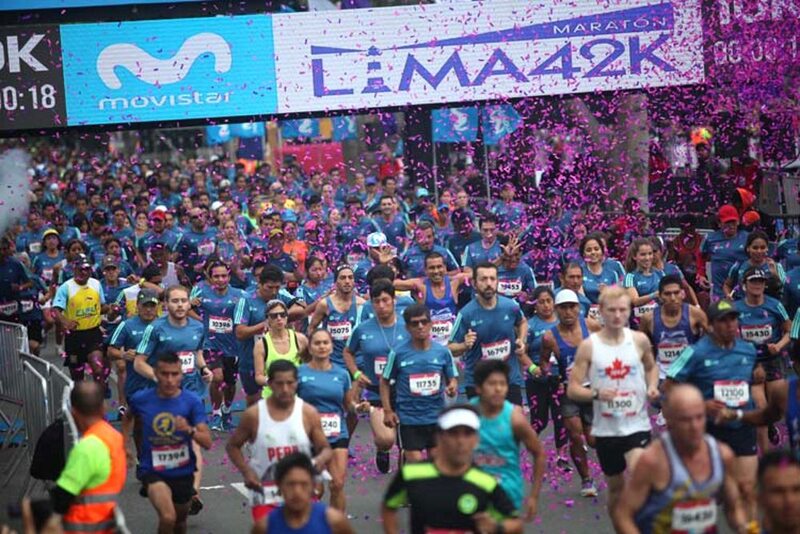 The Lima Marathon in 2017. Photo by lima42k.com. Lima Marathon — The biggest annual marathon held in Lima, the Lima42K attracts runners from across the world. The 2018 Lima Marathon will take place on May 20. Corpus Christi — Religious parades and festivities celebrating the Eucharist. Corpus Christi is really big in Cusco, but the processions in Lima are impressive, too. Corpus Christi is on May 31 in 2018. Fiesta de la Vendimia de Surco (Surco Wine Harvest Festival) — The exact date of the Surco Wine Harvest Festival seems to shift significantly from year to year. The 2017 event took place on June 8. The 2018 date is yet to be confirmed. 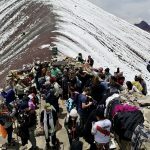 Festivals of San Juan and Inti Raymi — These festivals deserve a mention despite not being based in Lima. The Festival of San Juan is celebrated throughout the Peruvian jungle, in cities like Tarapoto and Iquitos, but events do take place in Lima (there are plenty of people from the jungle living in the capital). Inti Raymi, the annual reconstruction of the Inca ceremony of the sun and the winter solstice, takes place at Saksaywaman, just above the city of Cusco. 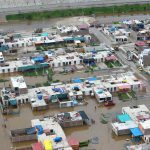 You might see some related events in Lima. Día Nacional del Cebiche (National Ceviche Day) — A nationwide event in honor of one of Peru’s most iconic dishes. Keep an eye out for restaurant offers, particularly in cevicherias across Lima, and other ceviche-related events. And before you go, read about the various types of ceviche that exist. Día de San Pedro y San Pablo (Saint Peter and Saint Paul’s Day) — This is a national holiday in Peru. Maritime processions pass along various coastal regions. In Lima, major street and coastal processions take place in Callao and in Chorrillos. Virgen del Carmen — A colorful religious procession in which the faithful carry an image of the Virgen del Carmen through the streets. It begins in a church in the Barrios Altos neighborhood and continues through Lima’s historic center. The procession is accompanied by bands playing traditional música criolla. Día Nacional del Pisco (National Pisco Day) — Keep an eye out for bargain deals on pisco in bars and restaurants across Lima. You might even come across some free tasting sessions. 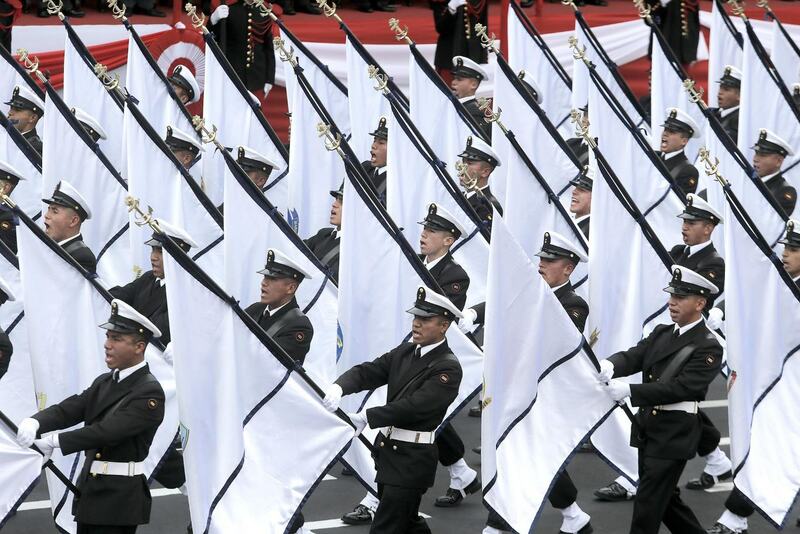 The Gran Parada Militar del Perú, a huge military parade in Lima on July 29 for the Fiestas Patrias. Photo by Galeria del Ministerio de Defensa del Perú, flickr.com. Fiestas Patrias (Independence Day celebrations) — Peru celebrates its independence on July 28, the day on which José de San Martín liberated Peru from its Spanish rulers in 1821. July 29 is a day in honor of the armed forces and police of Peru. Both days are national holidays with plenty of parades, pageantry and fireworks (and booze). 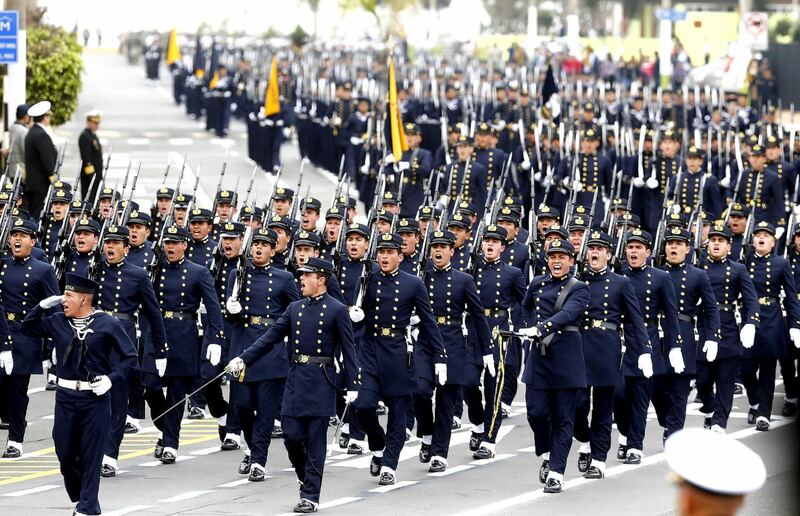 The Gran Parada Militar del Perú — a huge military parade in Lima — is broadcast live on TV across the country. Lima International Book Fair — This literary and cultural event has been going from strength to strength each year. 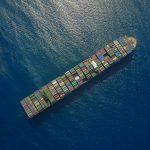 It typically runs for more than two weeks, with guest authors from across the globe, and now draws in around 400,000 attendees. The 2017 event started on July 21 and ended on August 6. 2018 dates are TBC. Festival de Cine de Lima (Lima Film Festival) — Peru’s premier film festival typically takes place during the first week of August. It lasts at least a week. The 2017 event started on August 4 and continues until August 12. Dates for 2018 have not been published yet; check the website for details. 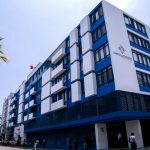 Anniversary of Callao — Callao gets two anniversary celebrations: the day it was recognized as a Constitutional Province (April 22, 1857), and the day it received political autonomy with the creation of the Callao Littoral Province (August 20, 1836). It’s complicated, but I’m sure no one in Callao cares too much after a fifth bottle of beer. Lima Half Marathon — Lima’s annual half marathon is one of the oldest half marathons in South America. It features both 10K and 21K events. Día de Santa Rosa de Lima (Saint Rose of Lima Day) — A national holiday in Peru in honor of Saint Rose of Lima, the first Catholic saint of the Americas and the patron saint of both Lima and Latin America. Lima Beer Week — A 10 day celebration of craft beer, which has blossomed in Lima in the last few years. Many of Peru’s best brewers will be involved, including Sierra Andina, Barbarian, Barranco Beer Company, Zenith and Nuevo Mundo — more than 30 bars and breweries in total. See the full schedule of events at limabeerweek.com. Combate de Angamos (Battle of Angamos) — A national holiday in honor of the fateful Battle of Angamos (1879), a naval encounter during the War of the Pacific between the navies of Chile and Peru. Peru lost the battle, in which the great Peruvian hero Admiral Miguel Grau Seminario also lost his life. The Señor de los Milagros religious parade in Lima. Photo by Mililo2012, Wikimedia Commons. El Señor de los Milagros — This is the biggest religious congregation in South America, with huge processions — including purple-robed devotees — passing through the streets of Lima. Hundreds of thousands of people walk through the decorated streets, with the main processions typically taking place on October 18, 19 and 28 (dates may vary and further processions might take place on different days). 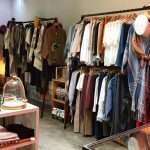 Anniversary of Barranco — The Barranco district of Lima celebrates its foundation with at least a week of events and festivities, including parties, parades and art exhibitions. Día de la Canción Criolla (Day of the Creole Song) — A day in honor of música criolla, a traditional genre mixing influences from Africa, Spain and the Andes. Keep an ear open for the sound of free concerts. Feria Taurino del Señor de los Milagros (Bullfighting Fair of the Señor de los Milagros) — The biggest bullfighting event in Peru and South America, attracting professional toreros (matadors) from the world’s major bullfighting nations. The event takes place at the Plaza de Toros de Acho, the oldest existing bullfighting ring in the Americas. The bullfights typically run through October and November. Understandably, protests often take place outside the arena. Día de Todos los Santos and Día de los Difuntos (All Saints’ Day and All Souls’ Day) — These two days are a mix of family feasts, graveside vigils and a bit of drinking (All Saints’ Day is, after all, a national holiday). Peru’s Day of the Dead isn’t nearly as colorful as in Mexico, for example, but you might come across some interesting parades. Halloween, which precedes All Saints’ Day on October 31, is growing in popularity in Peru, especially in Lima, but it’s not celebrated with as much planning and passion as in the USA. Festividad de San Martín de Porres (Festival of San Martín de Porres) — Saint Martin de Porres was born in Lima on December 9, 1579 and died on November 3, 1639. As a man of mixed race, Martin de Porres became the patron saint of mixed-race people, as well as barbers and innkeepers, among other things. His death is remembered each year in churches and cathedrals across Lima. Inmaculada Concepción (Immaculate Conception) — Another national holiday in Peru, this time in honor of the immaculate conception of the Virgin Mary. Expect to see religious parades and plenty of people dragging themselves to church. Christmas Eve and Christmas Day — People stay up late on December 24 to celebrate at midnight. On Christmas Day, adults recover from hangovers while kids play with their new toys. Christmas in Lima is a fairly standard affair, with bucket loads of commercialism and busy streets.